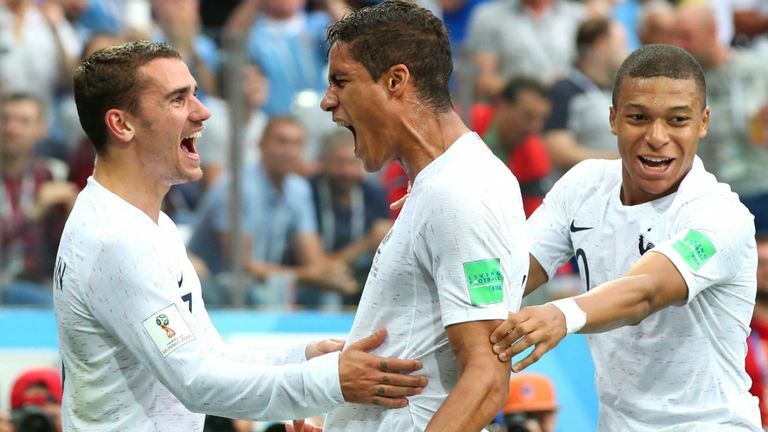 France reached the World Cup semi-finals for the first time since 2006 and ended Uruguay's dream with a 2-0 win in Nizhny Novgorod. Raphael Varane converted a clever Antoine Griezmann free-kick five minutes before half-time and the provider then profited from Fernando Muslera's goalkeeping howler (61) as Didier Deschamps' men booked a last-four showdown with Brazil or Belgium. France, out to emulate the triumphant 1998 team captained by Deschamps, were thankful for a several fine Hugo Lloris saves but his counterpart's blunder took the edge off the contest as Luis Suarez - without injured partner Edinson Cavani - toiled in vain.